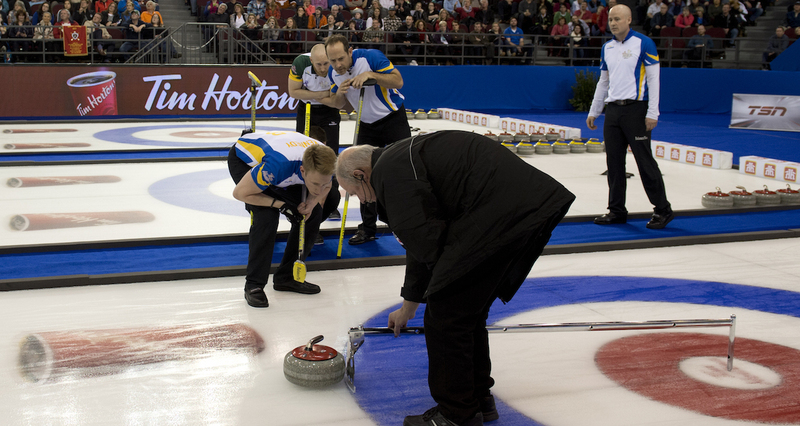 Curling Canada has implemented a National Umpire Certification Program. Standard guidelines for the training and development of curling umpires capable of officiating at provincial or national championships have been established. Umpires are currently classified according to their certification level and their role during championships. The only fees applied for the umpire courses are the Curling Canada’s Certification fees (20$ taxes included). Umpires Level 1 and 2 are chosen by the Host committee of the events. The head umpire of the event/championship is responsible for offering the courses in question about 1 month before the following events: Scotties, Tankard, Quebec Games, and the juniors, Senior’s, Masters and Mixed Provincial Championships. The course lasts for a full day and covers both levels at once (level 1 in the morning, level 2 in the afternoon). For umpires Level 3, 4 and 5, with Curling Canada’s agreement, Curling Québec chooses the umpires who are ready to receive a higher level of knowledge and will arrange the training sessions. For more information, contact Curling Québec at 514-252-3088 or by email at info@curling-quebec.qc.ca. Possess a level 2 certification. Receive a positive evaluation from a chief umpire, including a Curling Quebec designate and a representative of the Host Committee. The umpire must demonstrate qualities of leadership, ability to negotiate and arbitrate and the ability to effectively communicate with athletes, media, game umpires, Curling Canada’s event staff and host committees.